As a Florida native, I’m no stranger to Hurricanes. While we take them very seriously, we also know that “Hurricane Supplies” should include alcohol… especially at Trader Jay’s. Right on the heals of my trip to New Orleans, the perfect drink to feature, obviously, is the Hurricane. Created and made famous by Pat O’Brien’s on Bourbon Street, it is known for being a strong drink, traditionally featuring at least 4 oz of rum. The recipe on the Pat O’Brien site really is just “4 oz of rum and 4 oz of Pat O’s hurricane mix”… this is all well and good if you buy their mix but not if you don’t want to cheat. Another issue is that Hurricanes are a hard drink to tinker with because of the high alcohol amounts (had to keep some wits about me in case things went south with Hurricane Matthew). After some interweb research, I came up with my owen recipes. They both have the same ingredients, just with different levels of alcohol (let’s go with “Cat 1” vs “Cat 4”; We will reserve Cat 5 for one using Overproof Rum). For non-alcoholic ingredients I used orange juice, simple syrup, sour mix and cherry/pomegranate grenadine. 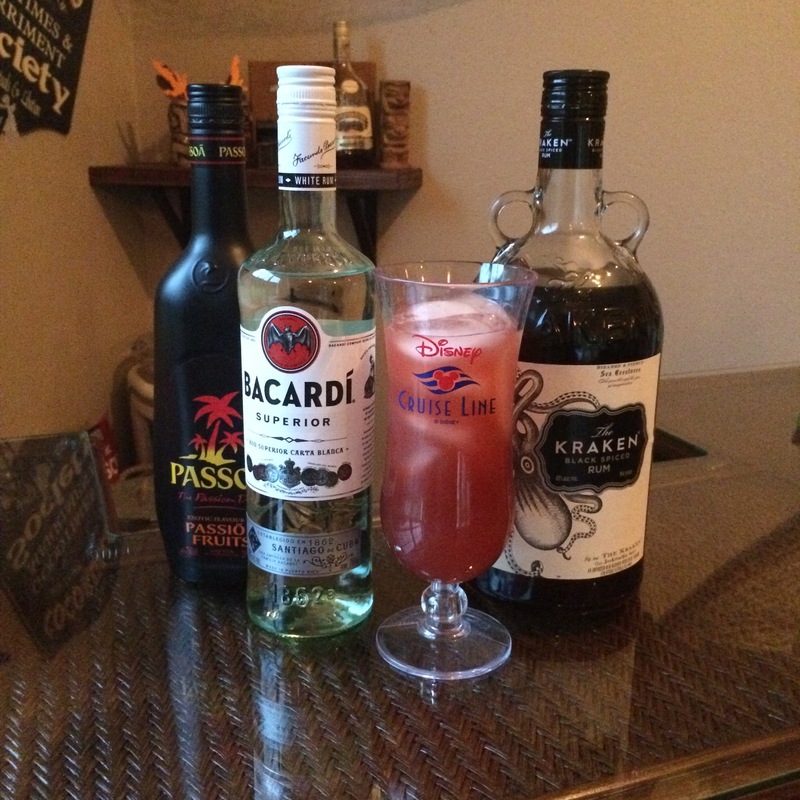 For rum I went with Bacardi white rum and Kraken black rum. Finally, a popular ingredient to use is passion fruit juice or purée, however I decided to up the game by using Passoà passion fruit liqueur… that’s right, even more booze! Pour all ingredients into Hurricane glass filled with ice, give a stir and enjoy! Should fit in Collins glass with ice.